The Clackamas clinic opened in October 2018. It is conveniently located off Interstate 205 at the Hwy 212 Damascus exit, across the street from Fred Meyer. We are located in the Greenhouse Square shopping center home to Taco Bell, Wendy’s, Black Rock Coffee, Subway, Dollar Tree, My Gym, Metro PCS and Farmer’s Insurance. The clinic serves the entire east side of the Portland metropolitan area that includes Gresham, Happy Valley, Damascus, Estacada and Oregon City. The location is also convenient to West Linn, Lake Oswego, Tualatin, Wilsonville, and Canby. 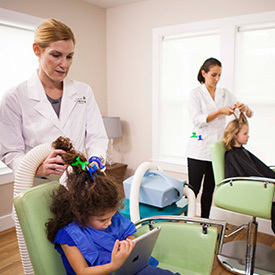 Recommended by pediatricians, our 3-step lice removal process, including our exclusive heated air technology, is 99%+ effective in killing both lice and their eggs. 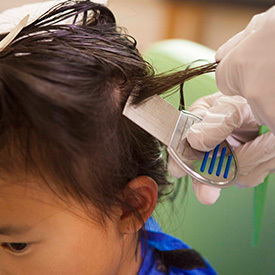 Call now to speak with one of our lice clinic specialists to learn more about our lice removal treatment options. Learn more about our revolutionary treatment options. We are currently available for treatments by appointment only. In general, our technicians are available seven days a week from 9am – 8pm, and will work to accommodate any special scheduling criteria you may have. 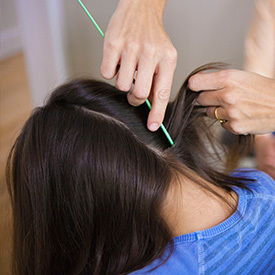 Our goal is to alleviate you of your lice problem. Call us to schedule an appointment or with any questions. We do not recommend the AirAllé® treatment for children under four or for clients for whom the AirAllé® is contraindicated. 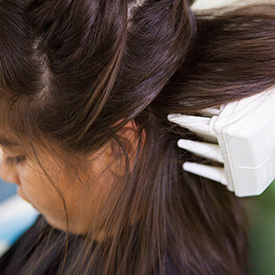 In these cases, we recommend a strand by strand traditional comb-out to remove lice and eggs using only non-toxic products. This option requires the following: Purchase of an at-home comb-out kit, 30 minutes of combing every day for 10 days, an oil application day 5 and day 10, and an in clinic recheck on day 11. We do not offer our re-treatment policy for this service. *PLEASE NOTE: The AirAllé® device cannot be used to treat persons who cannot sense temperature or pain; who cannot communicate physical discomfort; who have open head wounds, sores, or visible signs of skin or scalp abnormalities; who have received radiation treatment of the head within the last 6 months; who have cranial or facial implants; children under the age of 4; or who have hair that cannot be combed through with a standard comb.